Hi, I am interested in your 1964 Chrysler Imperial (stock #0708-NSH) listed on Autotrader for $15,995. I'd like to get more information about this vehicle and confirm its availability. 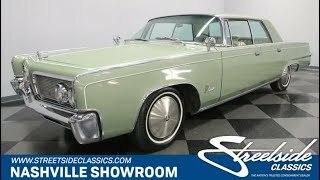 A survivor grade presentation of a 1964 Chrysler Imperial Crown. This rare and premium classic cruiser is believed to original everywhere from 413ci V8 to the Pine Mist Metallic paint so yes, we are excited about this one, too! The luxury of a Cadillac or Lincoln, but the rarity of a Mopar thats what this Imperial offers. And speaking of scarcely seen vehicles, this one is truly a standout with its level of survivor-quality features. For starters, according to the consignor, the Pine Mist Metallic paint is original to this car. Combined with the white pinstriping, and this sedan has the sweet appeal of mint candy. And nothing says luxury like a ton of brightwork. As a true 60s machine there was a lot of thought and design that went into the chrome bumpers just look at the intricate design of the rear one! Plus, detail elements like the trim that runs from headlight to taillight looks so nice and intact that it truly highlights the long and sleek profile of this premium Imperial. This hardtop sedan truly has room to carry all your family and friends in style and comfort. The two rows of button-top seating have the kind of intricate design that you only get once when new! And this is survivor-grade right down to the Imperial crown logos on the side trim. This is a true luxury machine, thats why you have rare features like a power adjustable seat and power locks. Plus, there are even provisions for factory air conditioning and power windows. Youll love slipping behind the dual spoke steeling wheel that has a pattern that matches the dash. This gives you a clear view at the gauge cluster, which truly looks like automotive jewelry. And the push-button transmission is all part of the premium vintage charm. With the originality of the interior and exterior, its great to have the original V8 under the hood. It has the perfect presentation for a survivor where the details are correct, right down to the decals. And the overall well-sorted appearance means its led a cared-for life. Theres even a new brake booster and master cylinder. The Imperials luxury also means power, and the 413 cubic-inch V8 offers plenty. Inhaling deeply through a four-barrel carburetor, these big block motors were becoming popular on the drag strips during this Imperials era. But this one is tuned for all-out comfort. Thats why you can pull away from stoplights with authority, and it cruises with confidence. What also helps this easy driving attitude are the power brakes, power steering, and three-speed automatic transmission. This one is so original and accurate, that even the mileage is believed to be correct averaging less than 1,300 miles annually! Its amazing a premium survivor like this can also be so affordable. Dont miss this opportunity, call today!